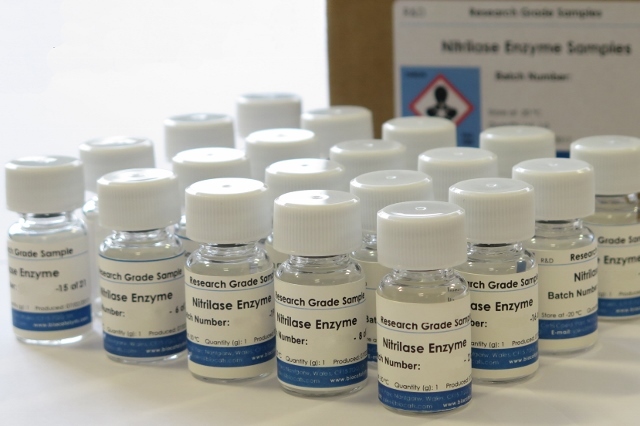 OVERVIEW: Biocatalysts’ enzyme discovery platform, MetXtra™, and research grade sample service were used to rapidly identify and isolate a set of 20 novel nitrilase enzymes, providing specialised enantiomer chemistry for our customer. This project was in collaboration with Chemoxy International Limited, CPI & Northumbria University. Whilst this case study is focussed on a speciality chemical application, a similar approach can be taken to discover and develop enzymes for food and other non-food applications. CUSTOMER CHALLENGE: A chemical waste stream from adiponitrile manufacture is used to produce a speciality chemical. This conversion is achieved with a nitrilase enzyme. An early feasibility study demonstrated that the conversion is complex and not sufficiently efficient for commercialisation. It was decided to probe Biocatalysts’ metagenomic libraries with the aim of discovering a commercially suitable nitrilase enzyme. APPROACH: 400 metagenomes were analysed and 1,209 hits to the probe sequence were isolated. These sequences were filtered through Biocatalysts’ bespoke metagenomics analysis software, MetXtra™, to produce a final set of 328 candidates. Within the filtering process, Biocatalysts’ ‘Design for Manufacture’ (DFM) principles are incorporated to maximise the probability that any of the selected sequences can be produced in any of Biocatalysts’ recombinant expression platforms and scaled up to large-scale manufacture. From the 328 candidate sequences, 20 distinct nitrilase sequences were isolated. These were gene synthesised and 20 one gram freeze dried enzyme samples were produced in 4 days, using Biocatalysts’ specialised Research Grade Sample Service. The enzyme samples were tested for nitrilase activity and the critical improvement in substrate conversion rate by Northumbria University. From the 20 candidate enzymes, 4 were identified as performing the correct chemistry and one that provides superior performance. Following the identification of the 4 functional metagenomics variants, we analysed their phylogenetic relationship to the original probe nitrilase enzyme sequence and found that all of these sequences were stringently related. This is a powerful demonstration of the use of metagenomics for the identification of novel or improved enzymes. Contact us to find out how our MetXtra™ Platform and Research Grade Sample Service can help you discover the best enzyme for your application.